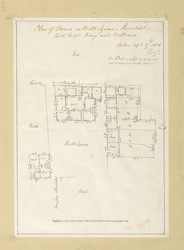 Plan of properties in Webb Square, Shoreditch, leased to Messrs King and Williams. The plan records the dimensions of the properties and the use made of the premises. A surveyor's note at top right states that the areas marked by the letter "a" don't form part of the lease.